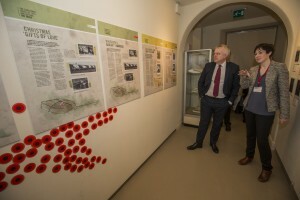 Key moments in Wales’ history during the First World War, including the Gallipoli Campaign, will play an important part in the events planned this year to mark the conflict’s centenary, First Minister Carwyn Jones has said. The First Minister announced the Welsh Government’s plans for the commemoration of the First World War in 2015 during a visit to the Christmas Truce exhibition at Bodelwyddan Castle which forms part of the Cymru’n Cofio Wales Remembers 1914-1918 centenary programme. The Welsh Government will be commissioning a touring exhibition on the Welsh at Gallipoli which will be launched in August and will tour until January 2016. Welsh forces arrived in Gallipoli on the 9th August 1915 and suffered heavy losses at Sulva Bay on the 10th. These losses were particularly felt in North Wales as the 6th and 7th Royal Welch Fusiliers were local Territorial battalions, and this day has been called one of the blackest days of the war for the region. Wales’ contribution at the Battle of Loos will also be remembered, which was the largest British offensive mounted during 1915 on the Western Front. Launch of the Wales at War ‘Theatres of War’ app, led by the National Library of Wales. 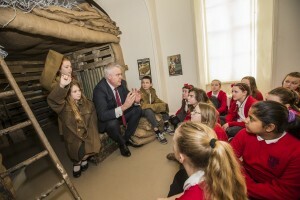 The First World War Education Project, funded by the Welsh Government is a partnership between the National Library of Wales and Amgueddfa Cymru – National Museum Wales. It will produce digital learning resources to enable young people to understand how Wales and the world changed as a result of the First World War. Anzac Day on 25 April. The First Minister will be attending a Service of Thanksgiving at Westminster Abbey. The First Minister said: “This year will see the centenary of significant events during the First World War which touched families and communities across Wales. These include the Gallipoli Campaign which particularly affected communities in North Wales, where the war memorials testify to the terrible impact of the battle on the 10th August 1915. During his visit to the Christmas Truce exhibition the First Minister also met pupils from Ysgol y Faenol, Bodelwyddan.